“So, Jack, is it safe?” I asked my brother. “Yes,”he answered. I detected a bit of annoyance in his voice. It wasn’t the first time I had posed the question. When Ariela was alive, I would never have considered risky activities. But without her, what have I got to lose? I had been to Juarez, maybe twenty-five years ago, before anyone heard about drug wars. I went to see a tiny pediatric orthopedic clinic where my brother was volunteering. 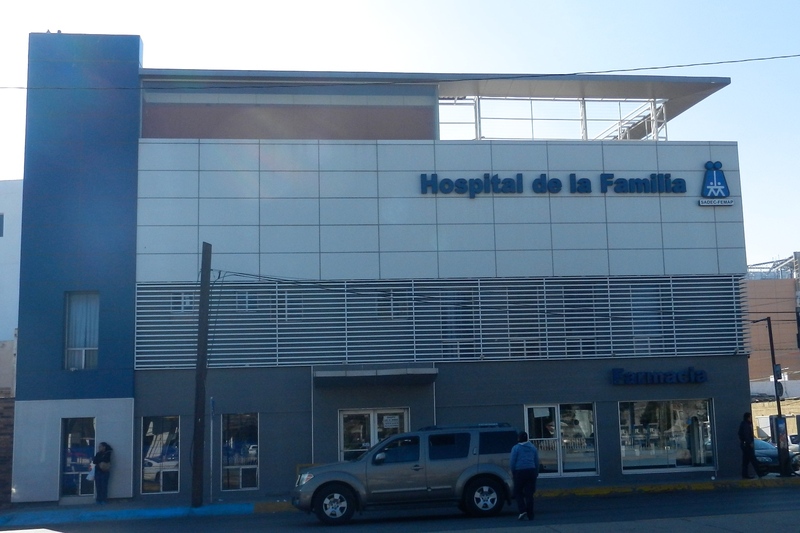 Back then, FEMAP’s Hospital de la Familia was a two-story building with about six beds all in one ward, closet sized rooms where Jack saw his patients, a small pharmacy, and little else. In spite of drug wars and ever-present poverty, the little hospital that could is now four stories, 110 beds, an OR (operating room), a NICU (Neo-natal intensive care), X-ray, and a nursing school. And, in the past three decades, my brother has crossed the border every month and treated over 7,500 children. Anna, the executive director, gave us a tour. “Some of our equipment may be outdated, especially by U.S. standards.” This is a hospital for people living in poverty. Patients and families pay on a sliding scale. FEMAP started with family planning and women’s and children’s healthcare. Today, their programs provide healthcare, education, mobile medical units, nutritional counseling, and even microloans. About a month ago, I sent Ariela’s medical equipment and supplies to FEMAP. Pulse oximeters and nebulizers and enteral feeding bags and C-PAP machines and therapy balls and medications, opened and unopened, that I don’t want to remember. Plus boxes of braces and orthotics from two orthotists, John Allen and Joe Muller, who wanted to help. “Everything you sent is being put to good use,” my brother said. “And the wheelchair? Is it here, at the hospital?” I admit to wanting to keep her chair. Her essence was in that chair. She traveled everywhere in it, out of the house and out of the country. The seat and back were custom molded to fit her frame. Paint splatters covered the arms. It had been recently repaired. Good as new. Looking at it kept her close to me. I don’t know anything about the girl who has Ariela’s wheelchair. I can’t imagine the great risks that mother took to bring her child into the U.S. and the risks she lives with every day. Her child deserves a nice chair. We enter Navajo Country (“the res” we hear Native Americans say). Little about this country feels familiar to me. We stop at the local supermarket. Men and stray dogs linger around the door. Everyone is dressed in black or grey or brown. The broad-shouldered women in the checkout line chat to each other in Navajo. “You really are conspicuous with your turquoise parka and blonde curls,” Gary tells me as I get back in the car. We came to see Canyon de Chelly (pronounced shā; literally meaning “inside the rock”). If we want to drive into the canyon, we need a guide. A man in his late seventies approaches us in the parking lot. “My name is Ben. I’ll be your guide today.” The old man speaks with a heavy accent. Some words I don’t understand, and Gary interprets for me. Some words Gary doesn’t understand, and I interpret for him. Between the two of us we get most of what Ben tells us. He says that he has guided people into the canyon since he was a boy, first in a horse-drawn wagon. “I didn’t know much English then. I just pointed.” Today, Ben drives a Jeep with a long crack across the front windshield. The road into the canyon is a dried riverbed of sand and mud. Deep tracks and pockets as big as the jeep run the length of the canyon. We ride over mud and snow from yesterday’s snowfall. Many of the pockets have become small ponds or are covered with ice. Ben stops the car, and we get out. 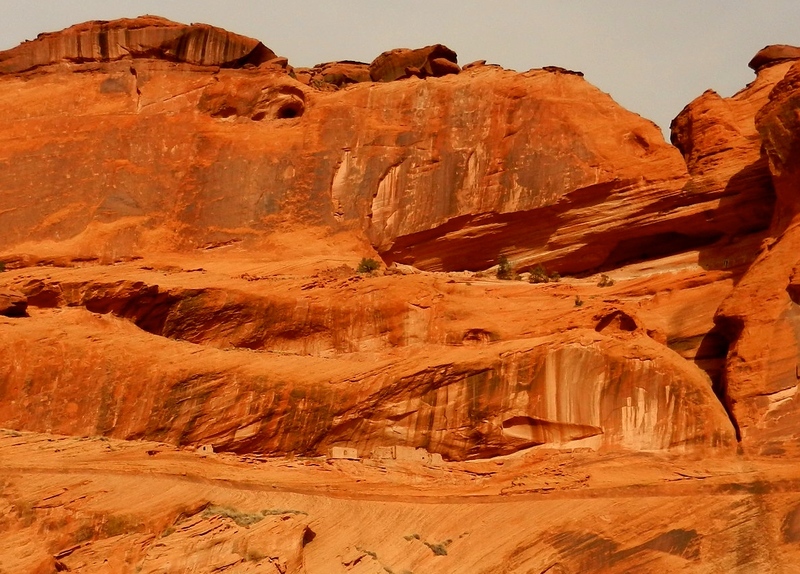 He points up the wall of an imposing red rock, over one hundred feet high. About thirty feet from the base, we see small, stone square structures built into a deep crevice. I ask Ben if the cave dwelling has a name. We continue deeper into the canyon. Ben stops and points to an open field below a huge rock. There are remnants of a fence but no structure. “This was my mother’s home. I was born here,” Ben says. I try to picture life amidst the high scrub grasses, cottonwoods, and muddy earth. “This is my land, and I’m giving it to you.” Ben stops and looks for me to acknowledge what he says. We pass a few horses grazing behind barbed wire fences. “Navajo horses.” A few ravens perch several hundred feet above us on the tops of the rocks, but none venture down into the canyon. We see no other signs of life. “Once this was a lush valley. We grew corn and squash and peach trees.” Then, Ben tells us how Kit Carson led the cavalry into the canyon and burned all of the Navajo homes. All of the crops, the fields and the peach trees were destroyed. 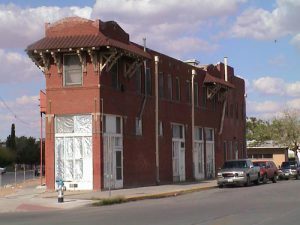 The Navajo were driven from the Canyon and marched to Fort Sumner several hundred miles away. Many Navajo died on the way. Ben drives on. He pulls into a small field surrounded by rock walls. We are now about 1000 feet below the rim and twelve miles into the canyon. Two small dwellings are planted near the base of the rock. One looks like temporary housing, the kind you see in trailer parks. The other, much smaller, is built with logs. No electrical wires. There are none in the canyon. Ben turns off the motor. Towering walls of rocks go on forever. We hear nothing, not even wind. “Get up! Gary, get up! You have to see this!” I was yelling over my shoulder not wanting to take my eyes away from the view outside our window. I jumped into my jeans and boots, threw on my parka and stepped out onto our snow- covered balcony. 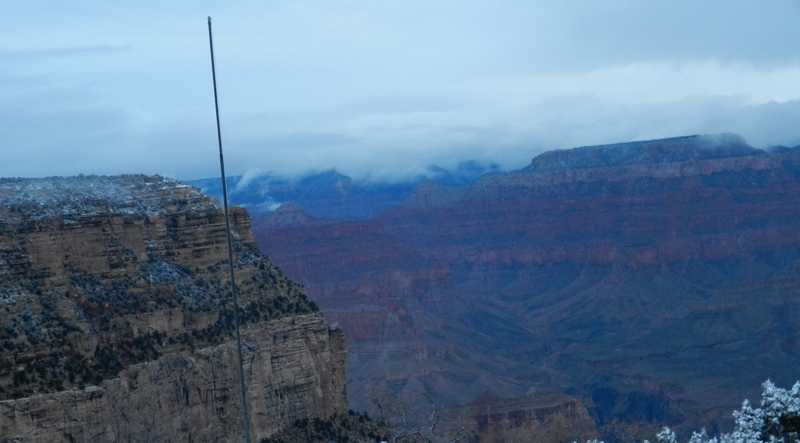 Below me, the Grand Canyon, stretching out in all directions, crowned by clouds and light. Nothing like I could have ever imagined. “Put on your clothes and come out here!” We were on the third floor of the El Tovar. Think old Swiss chalet crossed with an older Norwegian Villa. No elevator. We had arrived after dark the night before and had no idea what was outside our door. It had snowed during the night. More snow off and on throughout the day. We didn’t care. Exhilaration and awe kept us going. We hiked through flurries about two miles on Bright Angel (easy, but slippery with icy patches) and another two miles or so on South Kaibab (steeper, narrower, muddier). Then more hiking around the rim (mostly flat and paved). We had wanted to take Ariela to the Grand Canyon, but she nixed it. Maybe she knew that she would only be able to roll around the rim, or that it would be hard to see with her limited vision. This is what we talk about. A cold wind hit our faces. It was late afternoon. We hiked to our rental car and drove to a popular point to view the sunset. Other people were already there, taking all of the marked parking spaces. Gary spotted a place in a turnout. Then, as he backed in, BAM! A tree branch jumped out of nowhere and collided with the rear window. Shattered glass was everywhere –on the road, in the car, on the tree. Damn tree. Poor tree. Poor Gary. He has spent days planning this road trip, our first in almost forty years of marriage. I’m glad I wasn’t driving. Of course, this was just the first day. I’ll get my turn. Don’t make the Grand Canyon an if. Make it a must. Because the Grand Canyon is nothing like the pictures, and nothing I say about it will describe it. You have to see it. If you are able, get in it a ways down. And, don’t worry about parking. Free shuttle buses take you everywhere. Thanksgiving weekend. Five houseguests. Each with a different idea about football, stuffing and pumpkin pie. Our tradition is an excursion the day following the feast. One year, the Mission murals – fantastic. Another year, Chinatown – meh for the tour guide. Exploratorium – too crowded. 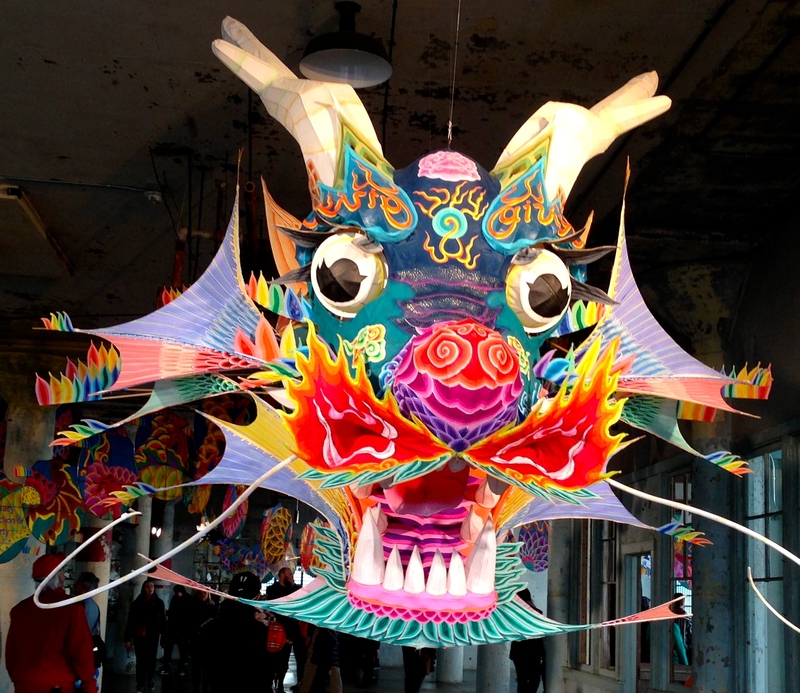 This time, we all agreed – take the ferry to Alcatraz and see the Ai Weiwei exhibit. Art and activism in the decaying penitentiary. Walk into the exhibition, and you are greeted by an enormous Chinese dragon. It hangs in the large open space that once housed the workrooms at Alcatraz. The doors are open and windows are broken. You can easily imagine a strong wind carrying the dragon out over the bay. Ai Weiwei uses images of flight and birds and wings to express freedom. 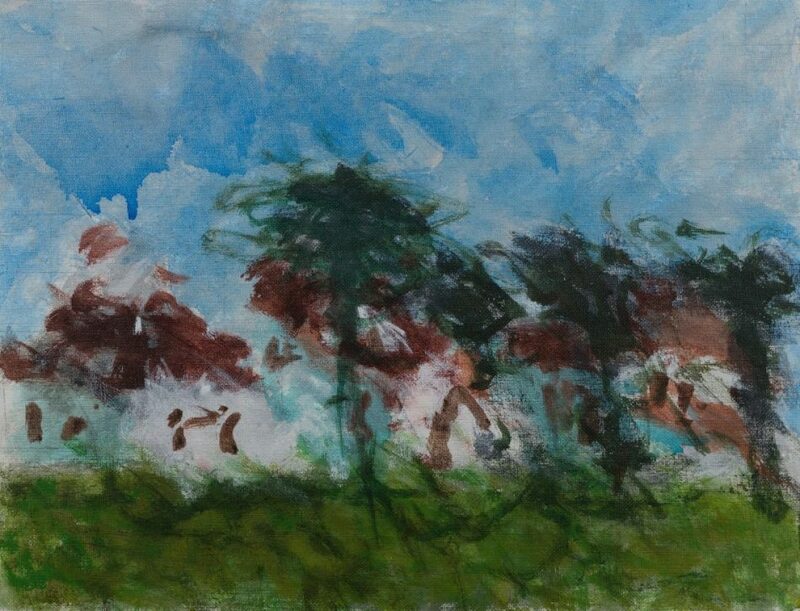 Ariela painted birds, birds in their nests, birds in bushes, birds soaring above the earth. No constraints. No political constructs. No boundaries. Not long ago, someone said Ariela was “wheelchair bound.” I thought that expression went out with “retarded” and “deaf and dumb.” I hope we’ve dropped these terms. I’m sure you can think of others. Ariela’s wheelchair gave her freedom to roll out of our house everyday – to go to school, and movies, and concerts, and parks. Her only boundaries were stairs. She may have been trapped in a body that didn’t work, but that didn’t stop her from visiting Alcatraz at least four times, including an overnight in Cell Block D.
The Ai Weiwei exhibit runs through April 26, 2015. It’s worth a trip to San Francisco. Get your tickets in advance, and go early in the day. You won’t want to miss this.